Architect Juri Troy’s House Under the Oaks is alow budget passive house for an Austrian family.With a minimum footprint, and a wide outstretchingwooden box on six columns, it offers a living areaof about 100 sqm. The whole structure was builton site last year from prefabricated FSC certifiedtimber and insulated with wood fibre insulationup to 60 cm thick. The interior is clad in local woodtoo, with a simple white pigmented oil coating. A ground source heat pump and heat recoveryventilation system help meet the tiny spaceheating demand — just 9 kWh/m2/yr — andthere’s ten square metres of solar PV panelstoo. Another interesting detail: there’s only oneinternal door in the whole house, for the guesttoilet. The architects call the house a “newprototype for affordable living” in ultra low energyhomes. The new headquarters of Danish energy firm Syd Energi not only meets the passive house standard, it produces more energy than its mechanical systems consume. Designed by GPP Arkitekter, and completed last year, the 9,000 square metre landmark structure houses 420 staff, and is one of the world’s largest certifiedpassive buildings. The roof features nearly 2,000 sqm of solar PV modules that produce 247,000 kWh of electricity per year. A 360 panoramic walk around the top floor gives an amazing view of the port city of Esbjerg, surrounding farmland, and out to the North Sea. The building’s central atrium funnels natural light in, while the exposed concrete slab offers thermal mass that helps smooth out temperatures inside. 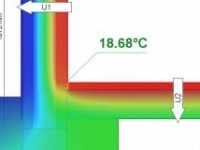 Air leakage is just 0.1 air changes per hour. The huge PV array helps to meet the energy demand of the basement data centre — in turn waste heat from this facility is used to provide much of the building’s space heating and hot water demand. 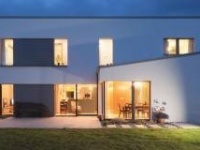 "Passive house is all about the overall approach,” says Søren Pedersen, director of the Danish certifier Passivhus.dk. "That is why we put the focus on the energy-intensive server system right from the very start." Is it possible to turn a 90 year old, north-eastfacing dwelling into a passive house whilekeeping its original facade? The Low Energy MZhouse in Barcelona says, emphatically, yes. Designed by Calderon-Folch-Sarsanedas architects,what's even more surprising aboutthis 2012 renovation is that it took just fourmonths to complete, and cut the house's spaceheating demand from 170 to 17 kWh/m2/yr. Theproject also won an Isover Energy Efficiency Award. To help re-orientate the tiny 80 square metredwelling, the architects installed a new skylightthat provides both passive solar gain in winterand cross-ventilation in summer ― and natural light all year around. A new, glazed timberframe facade stretches the tiny house out into the garden.The architects specified a "prefabricated dryconstruction system" to speed up the retrofit, and the different elements ― roof, facade, mezzanine,staircase and skylight ― were "designed like Meccano pieces to be manufactured with a numerical control system and afterwards assembled on site". The whole roof was mounted in just a few hours. The new timber-frame roof and facade are insulatedwith sheep wool and wood fibre, whileother walls in this terraced house are insulatedinternally with BASF Neopor foam insulation.The house has no mechanical heat source beyondits Zehnder Comfoair heat recovery ventilationsystem, which captures waste heat from outgoingair and uses it to heat fresh, incoming air. There'salso two-and-a-half square metres of solar thermalcollectors to help meet hot water demand. Nottoo shabby for a house built in 1918. The Larixhaus is the first pre-fabricated straw bale passive house built on the Iberian Peninsula. This single family home is located in the town of Collsuspina, near Barcelona. 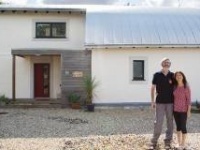 Developed by Jordi and Itziar in 2013, a pioneering young couple who wanted a comfortable, healthy and low-energy home built from natural and renewable materials, the Larixhaus brings together a team of passive house professionals who delivered it in five months, insulating it with locally sourced straw bales. The Larixhaus joins a short but growing list of passive house constructions in Spain, where climate-responsive passive design is well suited to the wide varieties of weather conditions, which range from cold and temperate to hot and humid. 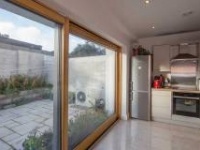 The dwelling is small and compact, with an optimised passive design and impressive level of airtightness — it achieved 0.32 air changes per hour on the first blower door test. Windows have timber frames with argon-filled, low-e tripleglazing. The airtight layer is provided by 22m OSB, with timber breather-board behind ventilated larch cladding on the outer skin providing an exit route for any moisture in the building assembly. Summer comfort is achieved through the careful choice and orientation of opening areas and external blinds on the southern façade. The timber superstructure and external cladding is PEFC certified. Healthy indoor air quality is achieved by using non-toxic natural materials together with heat recovery ventilation. The building’s embodied energy and fabric CO2 emissions are minimised by prioritising the use of natural, non-toxic, renewable building materials (certified timber, locally sourced straw, and cork). The pre-fabricated construction system developed by the contractor, Farhaus, allows for rapid on-site assembly, pre-installation of the airtight layer and window frames, with associated cost savings and near-zero onsite waste. Future installation of a grid-tied photovoltaic array will bring the building to a net-zero energy balance, with a rainwater catchment system to minimise mains water use. The Larixhaus puts high-quality straw bale passive house construction firmly on the map, coming in with a final build cost of €1,270 per sqm.